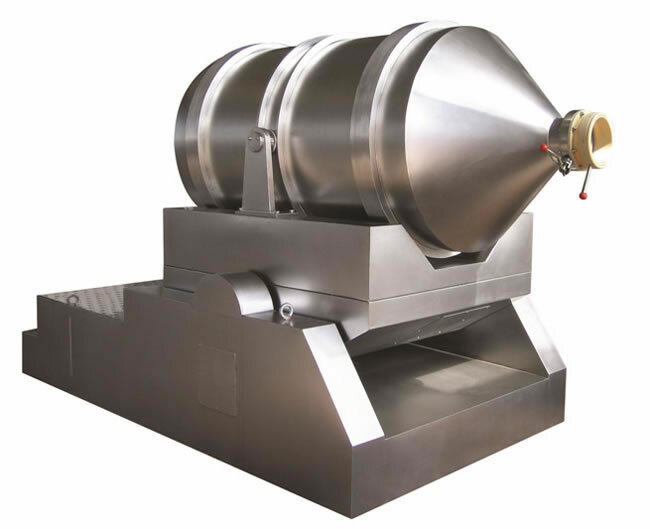 The EYH Series two dimensional mixer mainly consists of a rotating cylinder, swing support, and frame. The rotating cylinder lies on the swing support, supported by four wheels and its axial orientation via two catch wheels. Two of the four wheels are driven by the rotating power system to make the cylinder rotate. The two dimensional mixer swing support is driven by a crank swing stem structure which is mounted on the frame and the swing support is supported on the frame by the bearing parts. The rotating cylinder of EYH Two Dimensional Mixer can make two motions at the same time. One is the rotation of the cylinder itself, another is the swinging along with the swing support. Materials in the cylinder moves with the cylinder's rotation, turning and mixing, while also moving side to side. As a result, materials can be mixed fully in a short time. 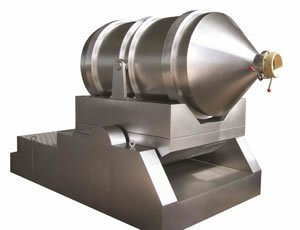 So this model is suitable for mixing of any powdered or granular materials. As an experienced two dimensional mixer manufacturer and supplier in China, Xianfeng Drying also provides a slot mixer, circle vibrate sieve, revolving vacuum drying equipment, high speed mixing granulator, and more.